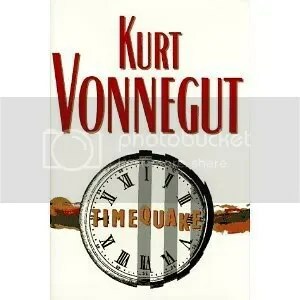 I just finished reading Kurt Vonnegut’s Timequake. I have mixed emotions right now, none of which have anything to do with the quality of this book. As is always the case with anything from this author’s typewriter, I absolutely loved it. Where the mixed emotions come in is that fact that this was Vonnegut’s last full-length novel. It is something of an auto-biographical nature, even though it’s disguised as a fiction story. But then, much of a writer’s supposed fictional output is auto-biographical whether they mean it to be or not. While I enjoyed the time spent with my old pal (and Vonnegut’s alter ego), Kilgore Trout, the old and long out-of-print science fiction writer, I was at the same time saddened to think that there would be no more like this. There will never be a new Vonnegut story. There will never again be a new quirky character sprung from the man’s amazing imagination. And yet, as long as his stories are around in whatever versions the future provides, be they paper and ink or in ebook form or even as audio books; the joy of reading Vonnegut will still be there for all of us. I didn’t mean for this article to turn out as an ode for KV, but it seems it has. As far as this particular book goes, it was 100% Vonnegut. I enjoyed it immensely from P.1 till the very last. If you’re a Vonnegut fan, this is a must read for you. For others, who’ve been living under rocks down by the river, you might want to try some of Kurt Vonnegut’s older material, like Player Piano and Sirens of Titan before attempting this one. You’ll need to be primed a bit on Vonnegut to fully enjoy this, his last full-length novel. My first experience with Vonnegut was when I was about 16 years old. A pal o’ mine turned me onto Breakfast of Champions. I couldn’t get enough of KV after that one. I cleaned the library out. I eventually bought most of his books. I still have them around here. They are part of my “keepers”, for sure. After reading this book today, I just might go digging through some boxes to find my Vonnegut stash. I’d like to visit with an old friend again, I think. You are irreplaceable, Mr. V.
Posted by V. T. Eric Layton on 20 November 2011 in Books and Literature and tagged book review, comedy, fiction writing, Kurt Vonnegut, satire, Timequake. I too am a long-time fan. Illustrated. 513 pages. Henry Holt & Company. $30. Hey, Eric. I did get Slaughterhouse-Five on audio a year or so ago. 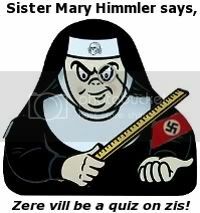 It was a bit bizarre. I had to read the synopsis on Wikipedia to remember much about it outside of the Dresden influence. I remember it being very thought-provoking. How would you compare Timequake to Slaughterhouse? Slaughterhouse-Five was actually a bit unique, as far as Vonnegut’s regular output went; in my opinion, anyway. It was meant more as a serious piece then most of his satirical pseudo sci-fi stuff. It’s been a long time since I read S-5, but I remember thinking back then that it was different than any of his other books and stories. For that reason, even though it’s an outstanding book, I don’t think it should be used as an accurate sample of all things Vonnegut.